I love cooking with quinoa. Not only is it good for you–being a complex carb and all–but I find that it’s much easier to prepare than regular long-grain rice. Here’s the sad truth: I had to invest in a rice cooker. Every time I try to make rice on the stove top, it ends up mushy in a pool of liquid, with the exception of this Cranberry Orange Rice Pilaf–the rice gods had my back with that day. I’ve tried every trick in the book and followed every bit of advice from friends and family, but my rice skills refused to improve. So, I bought a rice cooker. Now life is one giant peach! With quinoa, I don’t have to travel to the depths of the basement pantry to dig out my rice cooker. I just rinse it, toast it, and simmer until light and fluffy. It turns out great every. single. time. Good-bye rice. Hello, quinoa! I loaded this quinoa salad with every fall ingredient at my disposal. I even added a little something special: pomegranate seeds. I worked very hard to remove the pomegranate arils from my pomegranate, like, too hard. I tried breaking it apart, plucking each individual pomegranate–which resulted in a ruined shirt and splattered walls–and beating the pomegranate in order to loosen the arils, but nothing worked. Yes, they’re POM Wonderful, but they’re also a big POM pain in the booty. My suggestion: by the pre-seeded package of pomegranate seeds. Problem solved! This quinoa salad screams fall! The roasted butternut squash gets folded into the fluffy quinoa with the addition of dried cranberries, roasted pumpkin seeds, fresh parsley, scallions, and salty feta cheese. I couldn’t stop scooping forkfuls of this salad right into my face. If you love quinoa and fall squash, I highly recommend this Sausage & Quinoa Stuffed Acorn Squash. 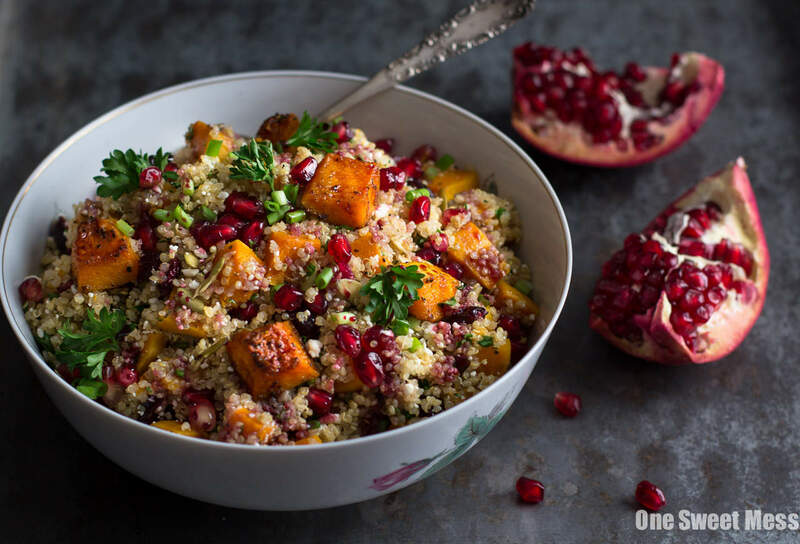 Head on over to Food Fanatic to grab this Roasted Butternut Squash Quinoa Salad recipe. Yes to fully-loaded fall quinoa salads!! I like making a dish like this with brown rice, so I’ll have to do it with quinoa next time around. Your pictures are soooo pretty, they’re making me want to put fall on repeat forever and always! Oh my gosh… this is so colorful I just want to shove my face in it right now! Beautiful photos! I just love how jam packed this salad is! So much fall goodness! And all that color! What a beautiful salad! Love how colorful and packed with flavor it is! What an absolutely beautiful salad! The pictures are so beautiful and real I nearly smashed my hand on the screen to try and reach for the bowl! My husband isn’t a huge quinoa fan so I made this with brown rice and it came out awesome! He’s pretty picky but we both loved it. Hi! Making it as we speak :) Do you eat the leftovers cold? Or is it better to mix as you’re ready to eat so quinoa and squash can be warmed up? Hi Arica! I like this salad cold or at room temperature. It’s really up to you. When I make it, I eat the leftovers for lunch straight from the fridge. Enjoy! I made this to take to a holiday pot luck yesterday. It was a huge hit with everyone there. Luckily, I doubled the recipe, so I had some leftovers to take home for my lunch. Thanks for an awesome recipe. DELICIOUS! The whole family loved it! I used the precut butternut squash from traders Joe’s, the balsamic glaze and pomegranate seeds from TJs too! This is a great salad but i found the scallions too strong to go with the butternut squash so i would leave them out for sure next time. To deseed pomegranates use a wooden spoon and smack the back of the skin of a half of pomegranate hard- you’ll get most of the seeds out this way- takes about 2 minutes to do a whole pomegranate and so much nicer to eat fresh seeds than a packet! Is the raw quinoa rinsed before it is sauteed?